Coming August 13th, but register today!! 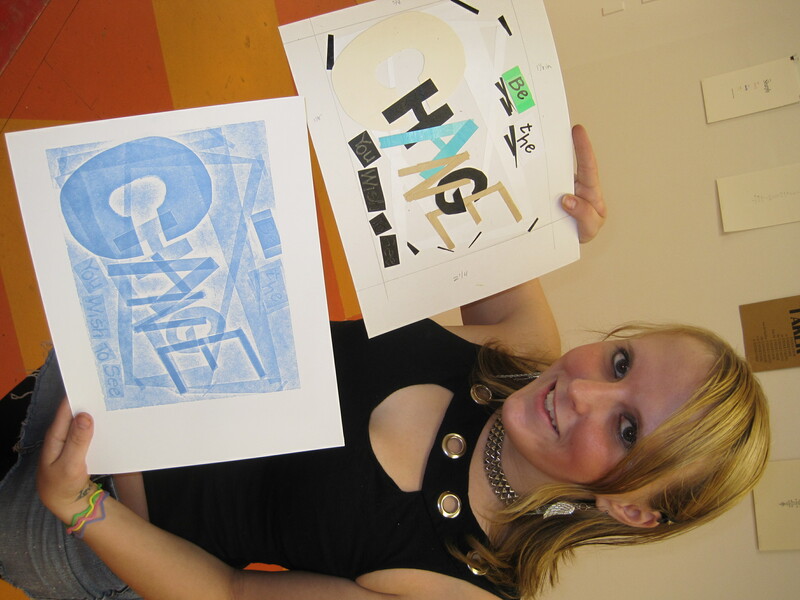 On August 13th Melanie will be teaching Pressure Printing on the Vandercook. To register contact www.is183.com or call 413-298.5252.
grounds as well as functioning on its own as an image. Here is Catt Chaput with a pressure print that she made during our quickie drop-in pressure printing workshop last weekend. So how does it work? Create a low-relief collage using torn or cut layers of paper, tape, labels, leaves, string, stickers, fabric and more. (Just nothing hard like beads or with too much dimension.) The pressure from the different textures as it goes through the press lets some ink get to the paper in varying degrees–resulting in a lovely halo-like, silhouette image. It’s a pretty magical and easy process. It’s going to be a ton of fun! So register today!